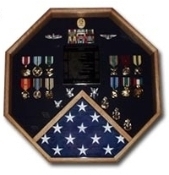 The tradition of presenting a shadow box to a retiring sailor is born of early British custom. the crew would construct a box of the finest timber and place within it all things that reflected his accomplishments. go ashore once and for all. 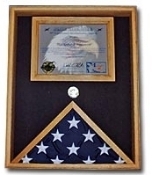 Presentation - "On behalf of your shipmates, we present you this shadow box. including the flag of the United States of America. he himself departed the ship. ship and go ashore once and for all. 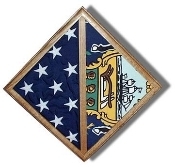 , including the flag of the United States of America. 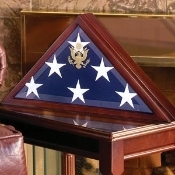 A U.S. flag will be placed in a d isplay case or frame if it is historic, if it was used during the funeral of a military veteran or mortally wounded soldier, or if it complements a display of medals or other patriotic items. 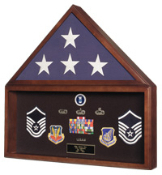 Historic flags usually are displayed unfurled and behind glass in a traditional frame. 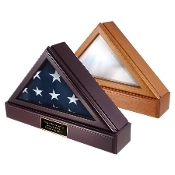 Flags used during funerals are folded ceremoniously and can be displayed in a smaller, triangular case. 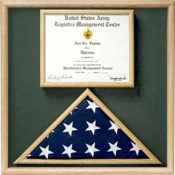 Flags that complement other items should be displayed in accordance with flag etiquette.